This Thanksgiving, I'm going with paper plates. I'll be about four weeks from my due date, so I'm not trying to complicate things by having to hand wash a service of fine china after dinner. Naturally, when contemplating paper plates worthy enough for entertaining I immediately think Caspari. You know I'm a HUGE fan of this brand...huge. And lucky for me, not only does Caspari have a flagship store in Charlottesvile - a frequent stop for us - but I also know a gal, Sarah, who went to UVA with me and now works for them. A while back, I reached out to Sarah to ask if the shop might be interested in collaborating with me on some holiday entertaining posts. The answer was an enthusiastic yes, so last Saturday I made a stop in Charlottesvile and met up with head merchandiser and store manager Kate Wade who walked me through the glorious holiday displays currently gracing the store. Kate is wicked talented and shared a wealth of information with me which I'm attempting to pass on to you via cleverly named (by me) tablescape ideas, photos, and tips. Today, it's all about turkey. 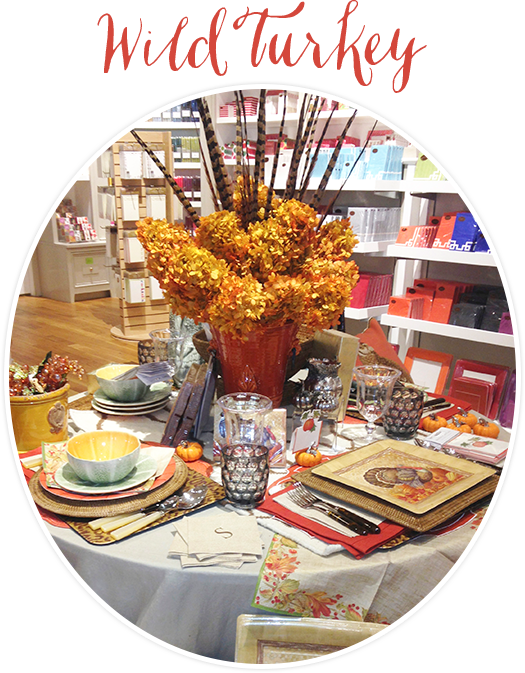 I was so drawn to this table in the shop because that centerpiece is so eye-catching in person! All of the traditional colors and motifs of the holiday are present, but accented with unexpected details like animal print and feathers. Don't forget the vertical space of a table! Kate says that they always try to work upward when designing their tables to give the eye various levels to enjoy. Although a tall centerpiece may not be practical when it comes time to actually eat - no one says you can't have one to display and delight your guests and then move it to a sideboard during the meal, especially if you need the room for serving plates. Who says your plates have to match? I know we are all comfortable mixing a dinner plate with a different salad plate, but why not vary your dinner plates? Something that is quite easy to do when you go with paper. I love the various dishes and flatware used at this table - the look is still cohesive but feels rich with so many elements. Napkins are your secret decorating weapon. 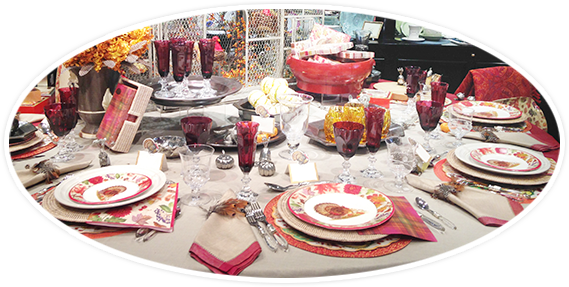 Kate and her team use them everywhere to add bits of color, pattern and texture to their tables. 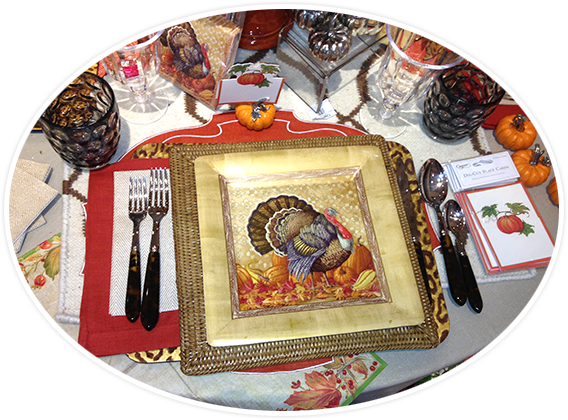 Look how a dinner napkin is displayed hanging under the turkey place-setting. Or how two napkins are used to cradle a soup bowl. My favorite trick is to use a cocktail napkin in a coordinating pattern under wine glasses. 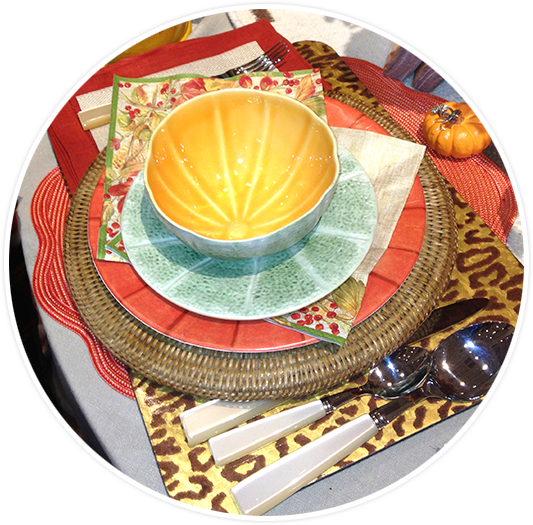 They are inexpensive and usually a great accent of pattern to use around the table. 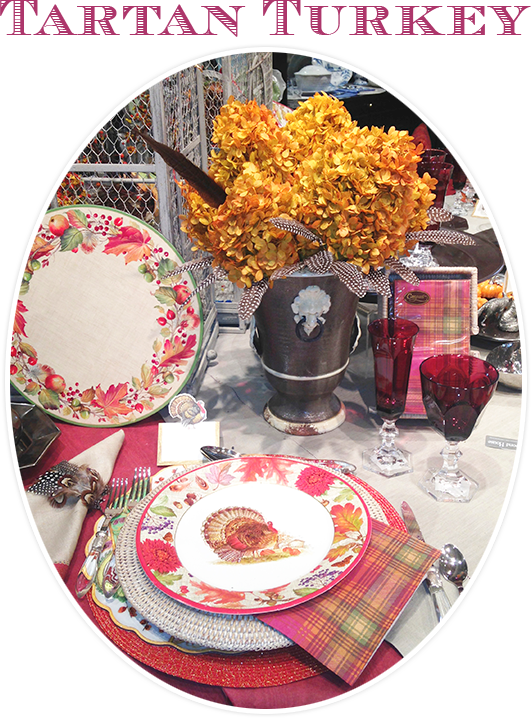 This table was calling my name with its pop of plaid and use of Imari, one of my all-time favorite Caspari patterns. I loved the very traditional feel created by the whole look and this table directly inspired what I'll be creating in my own home. Y'all, that one place-setting has five layers to it. FIVE! A red placemat, an Imari placemat (offset to peek out on the left), a rattan charger, a napkin, and a dinner plate. But it by no means feels overdone - it feels rich and lovely. This is when your hoarding tendencies can benefit you. I know I love to collect these items and by layering them, I get to use several of them at once. I think this is more pertinent when entertaining with paper products, but it's easy to let a theme get out of control. 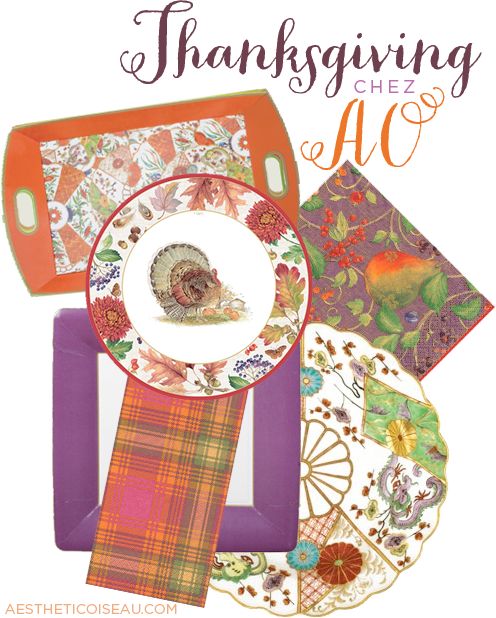 Turkey plates, turkey cups, turkey napkins, turkey napkin rings. 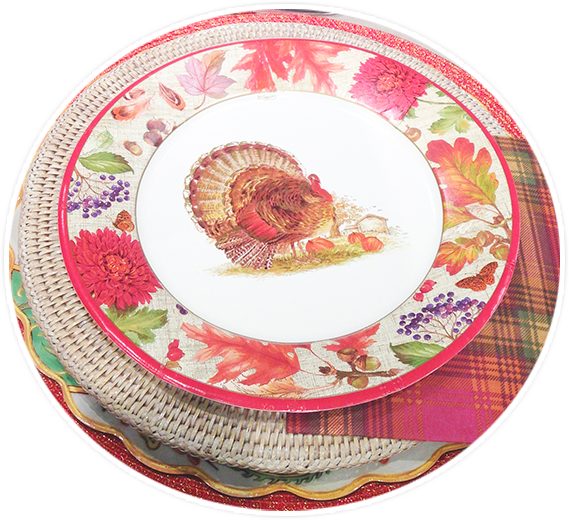 But Kate and team kept the turkey in check, only using this lovely turkey motif on the dinner plates. This way the table feels cohesive and on message, but doesn't overwhelm. Like anything in life - your home, your clothes - mix the high and low. There is no reason not to use your crystal when you're entertaining with paper plates. Break out the vintage silver. Decorate your table with your heirloom vase filled with fresh flowers. The beauty of paper plates is they let you use a fun pattern for that moment in time, but the way to truly pull the look off is to use the same pieces you would use with your china. Don't forget to check out the entire Caspari collection online - SO much to choose from for the upcoming holidays. Love these looks and that centerpiece is amazing.Of course when it comes to paper goods Caspari is the best!